A Chinese porcelain bowl (FS23/336) of finely potted circular form with hidden decoration, the white body incised with a pair of dragons chasing pearls, having a six character Yongzheng mark in concentric circles, sold for £56,000 after fierce bidding. Day One of the July 2014 Quarterly Fine Art Sale held at our newly opened saleroom complex in Exeter started with the silver auction of the sale, with many good prices achieved. 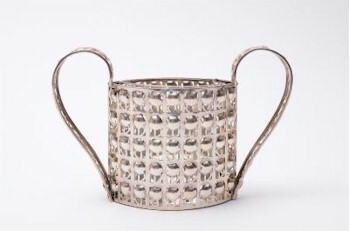 One of the top lots amongst the silver was a two handled vase by Josef Hoffman for the Wiener Werkstatte - A 'Gitterkorb' (FS23/100). The Josef Hoffman for Winer Werkstatte 'Gittergorb' (FS23/100) exceeded expectation in the silver auction to achieve £4,800. Being of oval outline with repeating rose motif decoration and similar decoration to the swept handles, it also bears the WW monogram, Hoffman monogram and Diana Hallmark. Carrying a pre-sale estimate of £1,000-£1,200, this unusual piece exceeded expectations, finally going under the hammer for £4,800. The unusual Elizabeth II silver novelty cruet set (FS23/51) realised £900 after A lot of pre-sale interest. 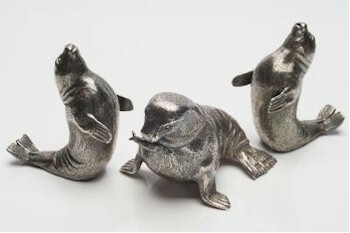 Another unusual lot was the Elizabeth II silver novelty three piece cruet set (FS23/51) in the form of seals. The salt and pepper were in the form of young seals, whilst the mustard pot was in the form of a large seal. There was a great deal of pre-sale interest in this interesting lot, which realised £900. 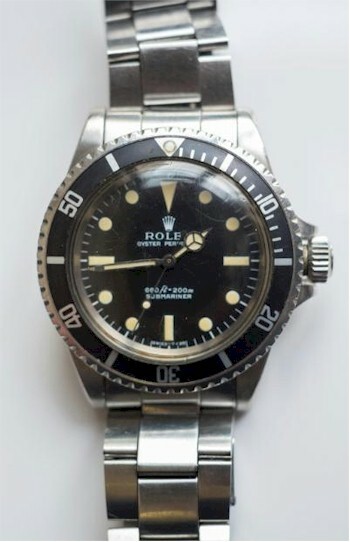 The Rolex stainless steel Oyster Perpetual wristwatch (FS23/161) was highly sought after by telephone and internet bidders and eventually sold well for £3,100. Although the Jewellery and Watches auction was smaller than usual, there were again some excellent prices. A gentleman's stainless steel oyster perpetual Rolex wristwatch (FS23/161) was highly sought after by both telephone bidders and internet bidders and finally went under the hammer for £3,100. Amber jewellery is increasingly popular at the moment as was proved in the sale by several examples, including this graduated amber bead necklace (FS23/185) that sold for £1,600. 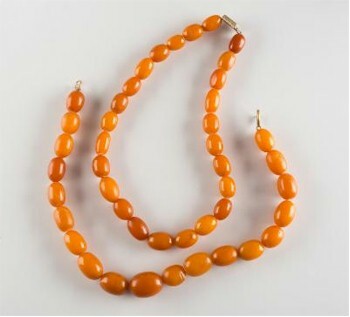 These amber necklaces (FS23/186) formed a single lot that sold for £2,800. Amber was showing very strong prices on the day. 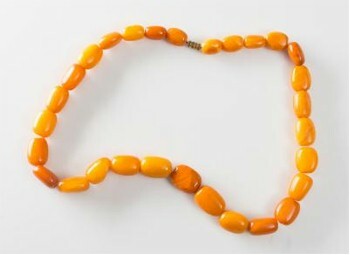 An unstrung amber bead necklace (FS23/182) exceeded all expectations fetching £4,900. Another amber bead single string necklace (FS23/185) sold for £1,600 and a graduated amber bead necklace, together with another (FS23/186) sold for £2,800. 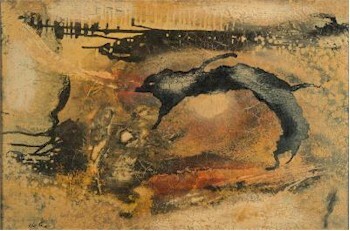 Leap, 1955 (FS23/222) by the late artist Paul Jenkins (1923-2012) sold for £5,800. The picture auction followed and there was keen bidding throughout the whole section from telephone and internet bidders, producing some outstanding prices. The section kicked off to a fantastic start with a painting by Paul Jenkins (1923-2012) entitled The Leap, 1955 (FS23/222). This oil on canvas measuring 53cm x 80cm, signed bottom left and on the reverse sold for £5,800 against a pre-sale estimate of £300-£400. The watercolor illustration for Mallory's Morte d'Arthur (FS23/245) by William Russell Flint (1880-1969) sold for £6,000. 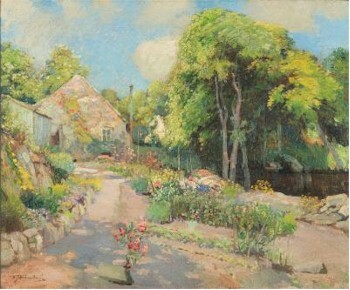 My Studio Garden (FS23/246) by Samuel John Lamorna Birch (1880-1969) was sold for £3,000. 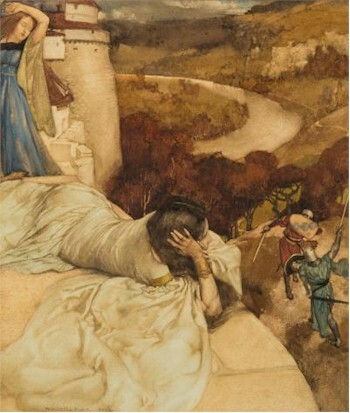 The watercolour by William Russell Flint (1880–1969) being an illustration for Mallory's Morte d'Arthur (FS23/245) sold for £6,000, whilst a painting by Samuel John Lamorna Birch (1869–1955) entitled My Studio Garden (FS23/246) sold for £3,000. The oil on canvas painting (FS23/291) by 17th Century artist Jacobus Storck (1641–c1693) realised £5,800. 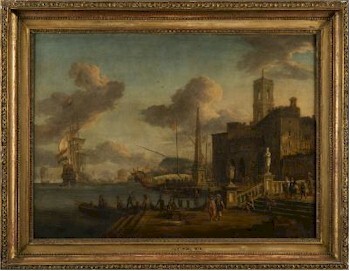 An interesting Eastern Mediterranean harbour capriccio with a Dutch man-o-war offshire by Jacobus Storck (1641–c1693) (FS23/291) realised £5,800. A few lots into the start of Day Two saw the top price for the sale come from the ceramics auction. 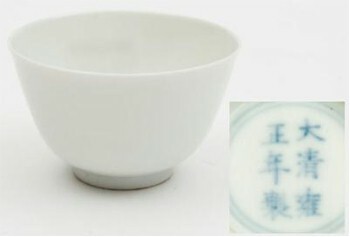 A Chinese porcelain bowl (FS23/336) of finely potted circular form with hidden decoration, the white body incised with a pair of dragons chasing pearls, having six character Yongzheng mark in concentric circles. Measuring just 6cm in diameter, there was huge interest from both telephone bidders, internet bidders and in the room that led the bowl to sell for £56,000. This Chinese armorial part tea and coffee service exceeded expectations (FS23/334), selling for £1,800. A Cantonese vase (FS23/357) dating from the late 19th Century realised £2,900. 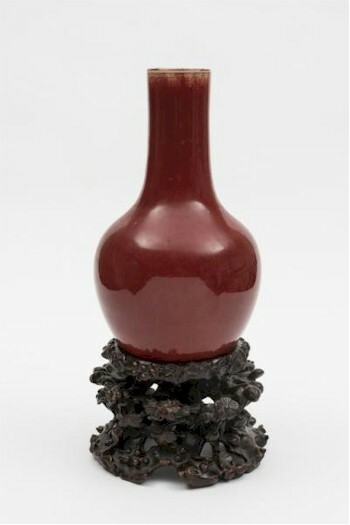 The Chinese sang de bouef bottle vase (FS23/370) also sold well, realising £2,400. A Chinese armorial part tea and dinner service (FS23/334) also exceeded expectations selling for £1,800 and a Cantonese porcelain vase (FS23/357) of hexagonal form dating from the late 19th Century sold for £2,900. Another Chinese piece that sold very well was a sang de bouef bottle vase, dating from the late 18th/19th Century (FS23/370). This vase, measuring 31.5cm, realised £2,400. The set of nine early 19th Century creamware bin labels (FS23/387) fell under the hammer for £1,000. 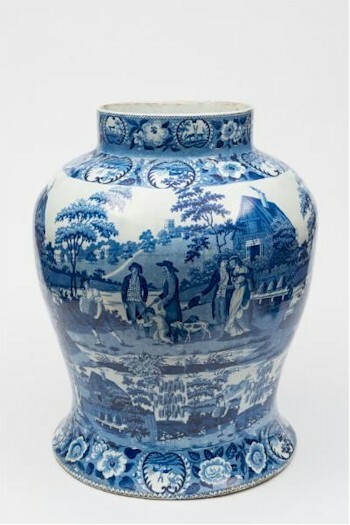 The massive Staffordshire Pearlware jar (FS23/391) sold for £1,000. 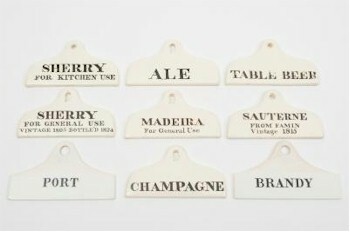 Moving on with the sale, a collection of nine early 19th Century creamware bin labels of traditional form (FS23/387) inscribed in black Table beer, ale, Champagne, Brandy, Port, Sauterne from Famin Village 1815, Madeira for General Use, Sherry for Kitchen Use, Sherry for General Use Vintage 1805 - Bottled 1824 sold for £3,300 whilst a massive Staffordshire pearlware jar (FS23/391) realised £1,000. Another major highlight of the Fine Art Sale was the price realised for this stunning and rare Chinese embellished hardwood box on a stand (FS23/496), which went under the hammer for £36,000. The Works of Art auction of the sale provided a few surprises too. 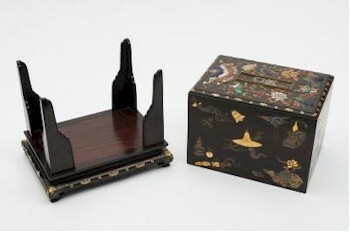 A rare Chinese embellished hardwood rectangular box on stand (FS23/496) exceeded all expectations. 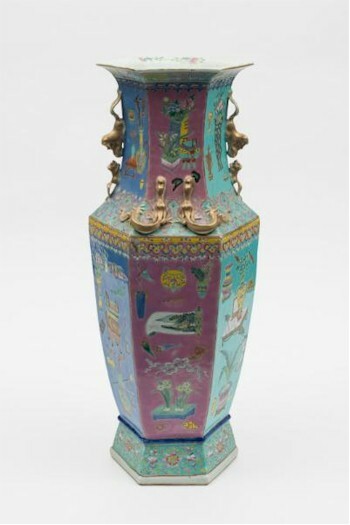 Decorated with precious objects and motifs in gold, silver and red lacquer, this stunning piece sold for £36,000. 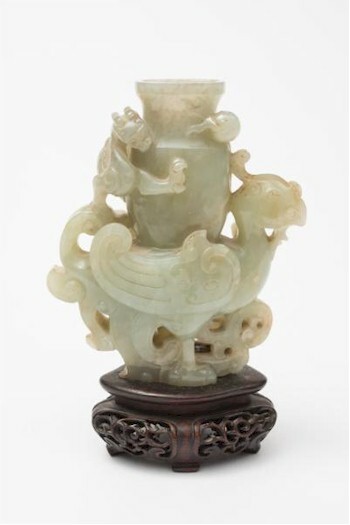 A fine Chinese carved celadon jade pheonix and chilong vase (FS23/526) realised £5,800 in the Works of Art auction. A Japanese Komai iron miniature cabinet (FS23/534) finally succumbed to a winning bid of £11,000 after a fierce battle from bidders worldwide over the telepone and Internet. A fine Chinese celadon jade phoenix and chilong vase (FS23/526) also sold well at £5,800. 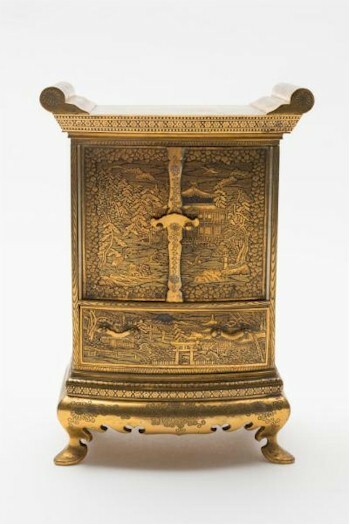 A Japanese Komai iron miniature cabinet (FS23/534) engraved and gilded overall with a river and landscape scenes with pagodas, boats and irises within diaper and floral borders realised £11,000 with fierce bidding again from the internet and telephone bidders worldwide. An oak refectory table in the 17th Century taste (FS23/669) realised £2,200 in the period furniture auction. 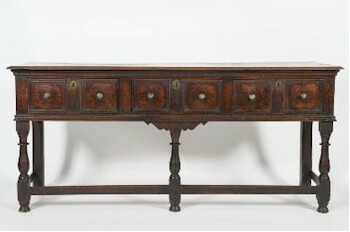 A late 17th or early 18th century oak dresser base (FS23/679) went under the hammer for ££2,350. 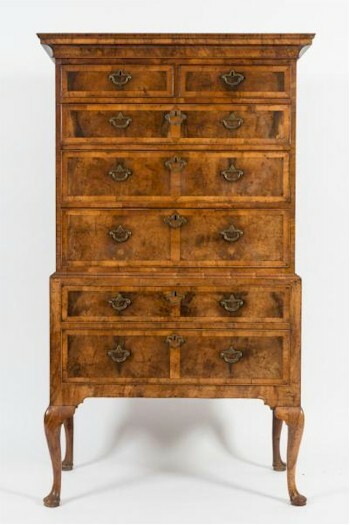 A George I walnut and cross banded tallboy (FS23/699) attracted a winning bid of £4,200 in the fine furniture auction of the Summer 2014 Fine Sale. Highlights within the final section of the sale, the fine furniture auction, included an oak refectory table in the 17th Century taste (FS23/669) which sold for £2,200. A late 17th/early 18th Century oak dresser base (FS23/679) realised £2,350; a George I walnut and crossbanded tallboy (FS23/699) sold for £4,200 and a mid 18th Century padouk tripod table (FS23/702) realised £3,600. The highlight of the period furniture auction was the 19th Century red lacquer and chinoiserie circular breakfast table (FS23/770) that fetched £16,000 in the South West of England salerooms. 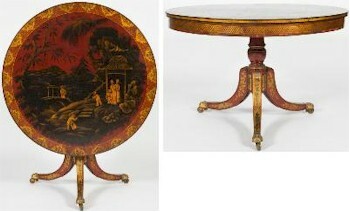 The star lot of the furniture auction was the 19th Century red lacquer and chinoiserie circular breakfast table (FS23/770). The top was decorated with a scene of figures in a pagoda garden landscape within an ogee floral foliate and lattice panel border heightened in gilt. It was raised on a turned central column and tripod splayed legs. Estimated at £1,500-£2,000, this unique piece went under the hammer for £16,000. Entries are currently being invited for the next quarterly fine sale to be held on 28th and 29th October 2014.